buynow/bloglater: Remember the sideways Hamsa? Have a great flight back to dubai! oh that is so cute! I love dainty necklaces for the exact same reasons you do. and my dad once scared me and told me a story about a girl who got strangled by her own necklace in her sleep. haha. yes. traumatic and I'll never forget it! aaaah i love this little piece. i prefer it in silver cos i'm not really a gold person... tried to purchase it when you blogged about it but obviously, it was sold out! This is gorgeous! So nice of the seller to give you one to say thank you too! I agree about lightweight and easy necklaces.. My boyfriend gave me a name necklace (in the style of Carrie's from SATC) and it's so perfect for chucking on for something extra! Also you definitely got the best of the UK in the weather! Have a good flight! Love it! So cute and seems like a great necklace for everyday wear. I love this necklace. The sideway cross necklace is also pretty amazing. Cant wait to get my own. 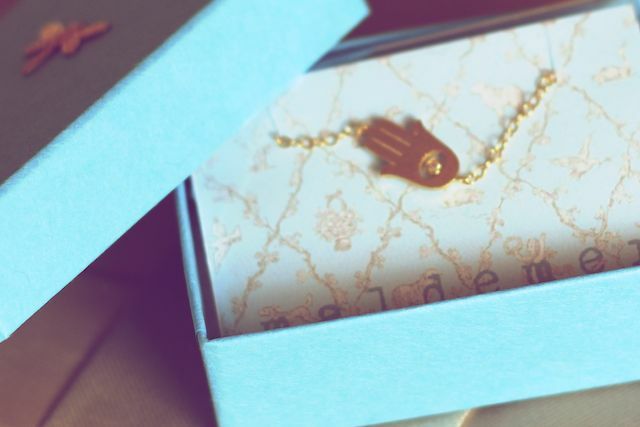 I love the sideways hamsa... so delicate and pretty! This is so delicate and just gorgeous! I love it! I love small dainty necklaces like that! The sideways ones too! I bought myself one of these when you did your giveaway post - gorgeous and I adore it. Only problem is deciding to go for my sideways cross, hamsa or Lena Wald peace sign! I did a little post on my top 25 Etsy finds for under $25 which features a lot of similar pieces for less! Also I can completely relate to that bittersweet feeling you're talking about. I live in South Korea, have done for 3 years now and whenever I go home it's the same feeling. So sad to leave friends and family in England but a bit excited to get back to my beautiful apartment and life here! i love it, i need one! So pretty, love this necklace! Will need to check out the Etsy shop asap! Seriously, I love shopping at etsy.com. They have fabulous stuff and I can go hours browsing! That is one cute necklace!! What a gorgeous necklace. I'll have to check out this shop. I LOVE etsy. Thanks for the share! This is beautiful! I love delicate necklaces like this! I love your necklace-need to purchase! :) Your blog is awesome-just became a member/follower of your blog. I hope you'll follow me back and we can keep in touch. Happy Blogging!!! Oh what a beautiful necklace :) I would like to have the same, really nice :) good taste and waesome blog!! :) What do u do in Dubai? Alas most of the things I like I still can't afford quite yet. This is the perfect blog for anyone who wants to know about this topic. You know You definitely put a new spin on a subject that’s been written about for years.Shop unique beaded Hamsa Necklace made with a variety of different stones and glass beads.Great stuff, just great! Nice post. As simple as it may seem, a single long necklace can make a statement on its own. These designer necklaces look striking in hues of gold. Various lock rings it sustains all the significant routers. Router Table Saw we believe it is the most effective router table for a DIYer.